Benoquin Cream (Monobenzone) is used to help people who are not producing enough melanin. This type of diagnosis is called Vitiligo. This is a de-pigmenting agent that isn’t widely used because there is still so much about it that remains a mystery. It is mainly reserved for patients that have more than half of their body surface with the presence of Idiopathic Vitiligo. Benoquin cream is a 20% cream and is available in a 20gm tube. Benoquin isn’t recommended for freckling but it has been used for such purposes. However, this can cause some permanent discoloration to the areas where it has been applied. It shouldn’t be used for malignant melanoma either. Benoquin cream is white in color and it has no taste. It is water based and it isn’t a cosmetic skin bleach product as some people assume. It should never be used as a substitute by patients that are to use Hydroquinone. There isn’t enough evidence to determine if the use of Benoquin Cream (Monobenzone) can be harmful during pregnancy. As a precaution, women who are pregnant shouldn’t use it. The use of Benoquin is allowed for children over the age of 12 if the doctor feels it is the best solution for them. The daily recommended dose for children is one application of a thin layer per day. For adults it may require 2 or 3 applications daily. 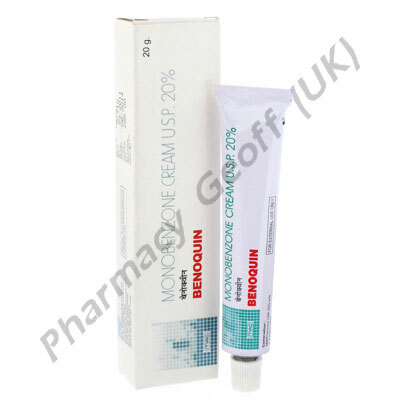 Some individuals experience skin sensitivity to the use of Benoquin Cream (Monobenzone) so it recommended to only apply it on a small area initially to see how it will affect the individual. If the area doesn’t become red and sensitive then it is fine to use it only on the areas that the doctor has approved. When using Benoquin cream, it is very important to use additional SPF sunscreen while in the sun as the skin will be more sensitive than before.